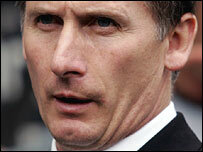 Glenn Roeder has resigned as manager of Newcastle United. Roeder and chairman Freddy Shepherd came under fire from fans after the home defeat by Blackburn on Saturday. Ex-Bolton boss Sam Allardyce has been linked to the vacancy at Newcastle, who have been hit by injuries this season and are 13th in the Premiership. A statement on the club's website said: "Glenn Roeder has offered his resignation with immediate effect and this has been accepted by the board." Newcastle have not scored a league goal at St James' Park in over eight hours of playing time, which is their worst run since 1951. Roeder spent 15 months in charge at St James' Park, including his spell as caretaker, and was desperate for time to turn things around after a dreadful run of injuries. During his reign, Roeder was able to name striker Michael Owen in his starting line-up only twice in 73 games. In addition, Roeder was without the likes of Kieron Dyer for long spells as well as Shola Ameobi and Damien Duff. Earlier in the season, Roeder claimed that no other manager could have done any better, insisting "we have had the worst injury crisis in the club's history and in any other club's history". Regardless, Roeder's position became virtually untenable when the fans turned on him after Saturday's 2-0 home defeat by Blackburn. And Shepherd confirmed to BBC Sport on Sunday night that 51-year-old Roeder had resigned. Five Live Sport's Ian Dennis said: "Roeder has resigned, walking away with immediate effect after being summoned to a hastily arranged board meeting on Sunday morning. "It's no surprise in the north-east that Sam Allardyce is already emerging as a strong favourite to replace him." Allardyce ended his eight-year reign as Bolton boss by resigning on 29 April. He previously turned down the Newcastle job before Graeme Souness, Roeder's predecessor, was offered it in 2004. Roeder's number two Nigel Pearson will take charge of the Magpies for their final Premiership game of the season at Watford on Sunday. He will be assisted by coaches Lee Clark and Terry McDermott. The fans are already restless after a disappointing season which has also seen them become angry at Shepherd, who has fought off two takeover bids in recent months. And supporters' frustration is sure to grow as Newcastle face the task of appointing a fifth manager in fewer than 10 years.